Linda Hoppe is the Owner, CEO and co-founder of Seminars for Health Inc, the leader in Massage Therapy continued Education in Canada. Linda has utilized her 20+ years of experience treating, instructing, curriculum design and course development to acquire the best faculty to develop courses exclusive to Seminars for Health. As a Lead Instructor, she taught Musculoskeletal Anatomy, Gross anatomy, Deep Tissue Massage, Arthrology, Advanced Massage Techniques, Treatment, Clinical Internship, and Kinetic Massage. Linda has an innate gift of instruction as well as developing courses that are comprehensive and challenging, yet achievable. Her course delivery is clear, confident and caring. Linda is the creator of both the Advanced OM (Orthopedic Massage) and Kinetic Massage Certification programs. Linda’s published, Dynamic Muscle Base and Kinetic Method principles of treating within Advanced Orthopedic Massage are created by Linda Hoppe, executing premium muscle therapy. Linda’s passion to elevate the profession of massage therapy is evident through her creation and offering of high-quality continuing education courses. 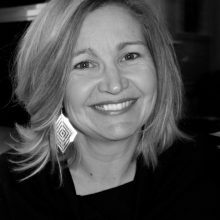 In addition, Linda is an active member of the Mount Royal University massage advisory committee and has extensive international clinical experience. She had the chance to practice the many languages she enjoys speaking working in Spain, Quebec, and Alberta. She holds a degree in Kinesiology from the University of Calgary, a three-year diploma as a Physiotherapy Technician from CEGEP F.X Garneau, Quebec and is a Massage Therapy graduate from Mount Royal University. The human body was born to move. Our Kinetic Massage courses are about getting your clients to move the way their bodies were intended to. Do you want to treat not only the muscles but the joints of the shoulder region? One step closer to be able to really make a difference with Kinetic Massage of the Hip. The joint that needs to move. I completed the prenatal massage course last weekend and was very impressed with the class content. I now feel much more confident in performing massage on my pregnant clients and now know how to properly position them. Thanks Jeanine!